MSC says world cruise generating buzz, but will it fill up? Filling the 2,250-passenger MSC Magnifica for its first world cruise could pose a challenge for MSC. Most world cruises are on luxury lines such as Silversea Cruises or Cunard Line, not contemporary lines. None of the U.S.-based contemporary cruise lines, such as Carnival Cruise Line, Royal Caribbean International or Norwegian Cruise Line, offer a 119-day cruise like MSC’s. However, Costa Cruises, which competes closely with MSC in the Mediterranean, does offer a world cruise in 2017 on the 92,700-gross-ton Costa Luminosa, which carries about the same number of passengers as the 95,128-gross-ton Magnifica. Roberto Fusaro, president of MSC Cruises North America, said the Magnifica was picked for the world cruise because it is the right size for the ports included on the itinerary. “The pool has a magrodome — making the ship ideal for all weather — and the ship has a high proportion of balcony staterooms,” he said. Fusaro said adding a world cruise will help MSC gain attention. “We’ve already heard a ton of buzz and excitement from our travel agent partners,” he said. Clients like the wide range of activities and entertainment and multiple dining options a ship the size of the MSC Magnifica affords, he said. Another feature that might help MSC fill the Magnifica is a relatively low price. MSC lists a lead-in price for the cruise of $16,999. A 120-day cruise on Cunard Line’s 2,014-passenger Queen Elizabeth departing in January has a starting price of $19,998. 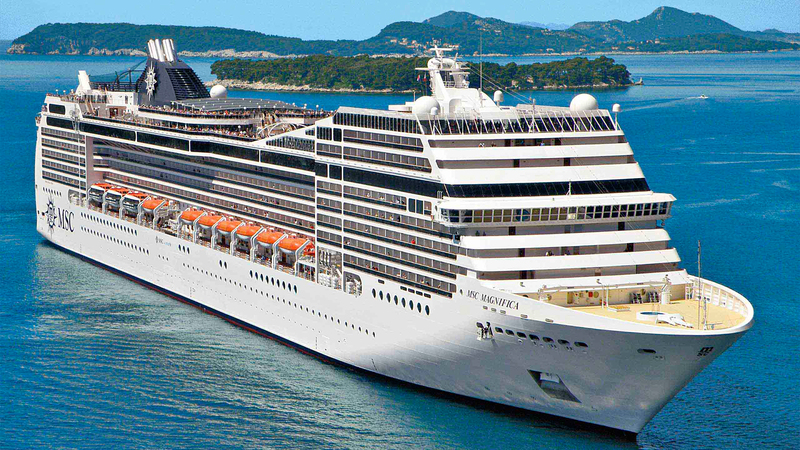 MSC’s price also includes 15 shore excursions. The 7-year-old MSC Magnifica is scheduled to set off from Genoa, Italy, on Jan. 5, 2019, and sail west until it arrives back in Genoa 119 days later. Along the way it will stop at 49 destinations in 32 countries and stay four days in French Polynesia, three days in both Hawaii and San Francisco and two days in Los Angeles. Following a week in the Mediterranean, the Magnifica will spend five days at sea before reaching the Caribbean in mid-January. It will transit the Panama Canal on Jan. 25 and proceed up the coast of Central America, Mexico and north to San Francisco. The next month will be spent crossing the Pacific with stops in Hawaii, French Polynesia and Fiji before arriving in New Zealand in mid-March. Australia, Singapore, Thailand and the Maldives precede an April 15 arrival in Dubai. The ship transits the Suez Canal in late April to arrive back in Genoa on May 3. MSC and its predecessor company, Lauro Lines, have been in the cruise business since 1960, but had never entered the world-cruise derby. “As one of the world’s truly international cruise companies, making available to our guests and travelers from around the globe a product such as a world cruise is a natural progression,” said Gianni Onorato, CEO MSC Cruises. Celebrity Cruises has revealed Celebrity Eclipse will become the first ship from a major line to homeport in Dublin in 2018 after spending the last eight years sailing out of Southampton. Solstice-class sister vessel Celebrity Silhouette will replace Eclipse in Southampton, offering northern Europe and Mediterranean itineraries from 2018. The deployment is the most significant ever made in the UK and Ireland by Celebrity Cruises. Silhouette will sail seven and eight-night Norwegian Fjord sailings, 12 to 14 night Scandinavia and Russia itineraries and 13 to 14 night Mediterranean, Canaries and Azores itineraries. Jo Rzymowska, vice president and managing director for the UK, Ireland and Asia, said: “The performance of the Celebrity Cruise UK and Ireland business has gone from strength to strength in recent years and we are pleased to be able to grow our offering in the region with both Celebrity Silhouette and Celebrity Eclipse homeporting from here during the 2018 season. Rzymowska said Celebrity Eclipse is well known by customers and trade so would build a solid foundation as the line’s first ship sailing out of Dublin. “Eclipse is a much-loved ship, so by moving her to Dublin we believe some guests will follow, as well as attracting new passengers too. Russia sailings on Celebrity Silhouette from Southampton in July 2018 include the chance to attend the 2018 Fifa World Cup in Moscow including the third position match in Saint Petersburg. During its farewell season in 2017, Celebrity Eclipse will host a special ‘Modern Luxury’ two-night sailing to Le Havre as well as a President’s Cruise attended by the line’s president and chief executive Lisa Lutoff Perlo. The Solstice-class ships will be joined by two other Celebrity vessels in Europe in 2018. Celebrity Constellation will sail out of Venice, Rome and Barcelona while Celebrity’s newest ship Reflection will sail out of Rome with eastern and western Mediterranean itineraries. Above image of the AIDAperla, the twelfth ship in AIDA Cruises’ fleet, which has undergone a paint job at Mitsubishi Heavy Industries’ (MHI) shipyard in Nagasaki, Japan. Following the completion of the works on the 300-meter long hull of AIDAperla, the newbuilding vessel has now received the mouth and the eyes, the symbols gracing AIDA Cruises’ fleet. The bow design of the AIDAperla is 261 meters long, according to AIDA Cruises. Finishing touches to the new ship will follow in the spring of 2017, the company said. Once completed, the new cruise ship will be able to accommodate 3,300 passengers and 900 crew members. The AIDAperla is expected to start voyages from September 1, 2017, sailing on four different routes in the Mediterranean Sea. Palma de Mallorca and Barcelona will be the first and the last ports of call for seven-day voyages. Apart from Mallorca and Barcelona, the AIDAperla will also visit Corsica, Florence/Livorno and Rome/Civitavecchia.